Hi everyone, Steph Ackerman here to show you how to create an all season wreath, a wreath that can be used for any season and any event. Starting with a Smoothfoam wreath, simply wrap red ribbon tightly around the wreath. Place bow wire within the Bowdabra and tuck it underneath. Leaving a 4″ tail, place the red ribbon in the Bowdabra. Create a 5 looped bow, using the bow wand to push the ribbon into the Bowdabra. 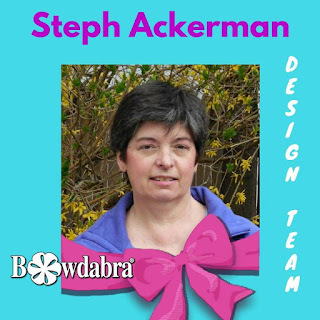 Place pink tulle within the Bowdabra next and create a 3 looped bow. Take small flower sprays and place on either side of the channel. Pull up on the bow wire and tie off, ensuring the floral sprays and anchored to the bow. Then take the floral wires and wrap them around the bow. Fluff the bow. Use the bow wire to tie the bow to the side of the wreath. Reposition the loops so the tulle bow sits within the red bow.